Resolution Mapping™ is an ideal process for assembling, evaluating, and structuring complex information regarding a Wicked Problem. More importantly, the various outputs lead directly to decisions regarding action items and responsibilities for those actions. When a Mess Mapping project precedes Resolution Mapping, the Mess Map process and diagram provide significant input for Resolution Mapping while creating efficiencies. For example, much of the data collection, interviewing, and data structuring will have already occurred. However, if the Resolution Mapping process has not been preceded by a Mess Mapping project, then the first step is to conduct interviews with decision makers and influencers. We try to interview all those who are likely to attend the subsequent Resolution Mapping workshop. We also may interview industry and government experts along with other constituency stakeholders. Our interviews are usually augmented with market, scientific, and policy information. However, we do not conduct primary research. The sponsoring organization(s) typically identifies an engagement manager who is the point of contact for the facilitators and who aggregates feedback from participating organizations. The facilitators review and synthesize the interviews, integrate external data, and then create draft Endstates and Events. The facilitators and sponsor representatives review all the workshop materials and agenda. After the workshop, sponsors may follow up the Resolution Mapping workshop with one or more optional post-meeting tasks. For example, facilitators may create a presentation that can be shared with others documenting the process, participants, and meeting outcomes. Other post-meeting steps include working with stakeholders to further prioritize and implement key action steps. Some clients have created a “war room” using key Events related to the desired Endstate. New Events may be created and posted on walls or other displays together with the Events from the Workshop. The War Room provides a summary of the desired outcome and a dashboard for monitoring the internal and external contexts. 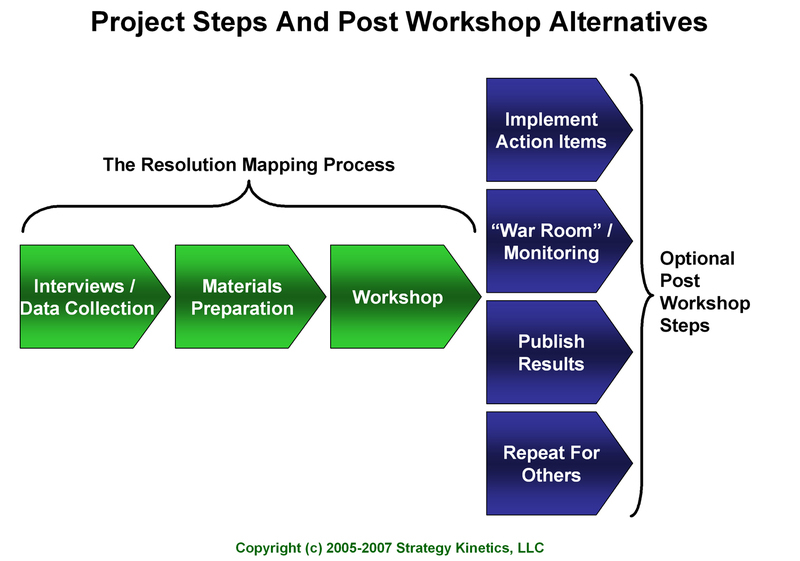 The War Room presentation can be reviewed with key stakeholders inside and outside the organization as an efficient way to document the meeting outcomes, to reinforce the objectives, and to maintain focus on the key Events. In some circumstances, it is beneficial to repeat the Workshop with essentially the same materials for different audiences. This may be especially useful when different geographic regions are affected by the same Wicked Problem. Getting the local view may be an important step in understanding regional similarities and differences in how the Social Mess is viewed, in desirable outcomes, and in constraints on actions.